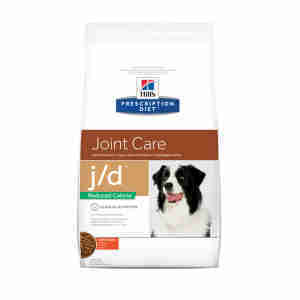 Hill’s Prescription Diet Canine j/d Reduced Calorie Joint Care is a complete food tailored to help dogs with mobility issues. Hill’s Prescription Diet Canine j/d Reduced Calorie Joint Care contains EPA – an omega-3 fatty acid from fish oil that helps to reduce joint pain caused by mobility issues such as arthritis. Though you might not notice it, with daily rough and tumble your pet’s joints are in constant use. Dogs with mobility issues struggle to replace cartilage in the joints, which is worn down naturally with age and play. Prescription Diet Canine j/d uses a blend of glucosamine and chondroitin to sooth aching joints and maintain healthy cartilage. This special combination also helps to combat destructive enzymes in the joints. If your dog is overweight it could be making their joint problems worse. Hill’s formula is designed specifically for dogs who are prone to putting on weight so is perfect as part of a calorie-controlled diet. With this clever blend of oils and nutrients you could notice a difference in your dog’s mobility in as little as 21 days. specifically designed for dogs who are prone to weight gain to be used as part of a calorie controlled diet. Mobility issues such as hip dysplasia and arthritis are the most common problems and require treatment to keep your pet moving happily and healthily. If you’ve noticed your dog is slower getting up or lying down, is having problems climbing stairs, is tiring more easily or showing signs of stiffness, it could be the sign of a mobility issue. Consult your vet for an examination and diagnosis straight away. Because veterinary diets are formulated for the nutritional support of pets with specific clinical conditions, we recommend that you only use them under professional advice. For more information on feeding Hill’s Prescription Diet Canine j/d Reduced Calorie Joint Care to your dog, please consult your veterinary surgeon. Fat 13.3%, fibre (crude) 9%, moisture 8%, protein 21.8%. Vitamin A 9203 Iu, vitamin C 110 mg, vitamin D 727 Iu, vitamin E 660 mg, beta-carotene 1.5 mg, calcium 0.61%, carbohydrate 43.2%, chondroitin sulfate 805 mg, EPA 0.35%, glucosamine 1165 mg, L-Carnitine 310 mg, magnesium 0.15%, Omega 3 -fatty acids 3.18%, Omega 6-fatty acids 2.23%, phosphorus 0.54%, potassium 0.75%, sodium 0.24%, taurine 1025 mg.
My 13 year old lab has been on this since she was 4 due to her hind legs needing titanium plates as her cruciate ligament had gone in both legs. I was recommended this by the consultant and she's been on it ever since. Not only has it helped with movement but has also helped keep her weight under control. Her coat is amazing too. For a 13 year old girl shs's doing pretty amazing and I swear most of it's down to this diet. We have tried to feed our dogs on other makes of food, but they end up with upset tummies. We are now using this very good dog food permanently. Extremely happy with price from PetSupermarket and delivery. Highly recommend PetSupermarket. Excellent product would not use any other dog food. re-ordered dog food. arrived promptly.